In this post Tim Darach gives a brief history of the origins of computing and identifies some of the key people involved in it’s inception. The original post can be read here. So by no means the first example of information gathering in England is John Graunt’s Natural and Political Observations on the Bills of Mortality, 1662, but it was “the seminal work which effectively founded not only political arithmetic [statistics], but also social statistics and historical demography” (Slack, 2004). 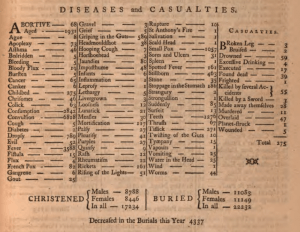 Graunt collected and tabulated the historical records of births and deaths, the Bills of Mortality, from each London parish. 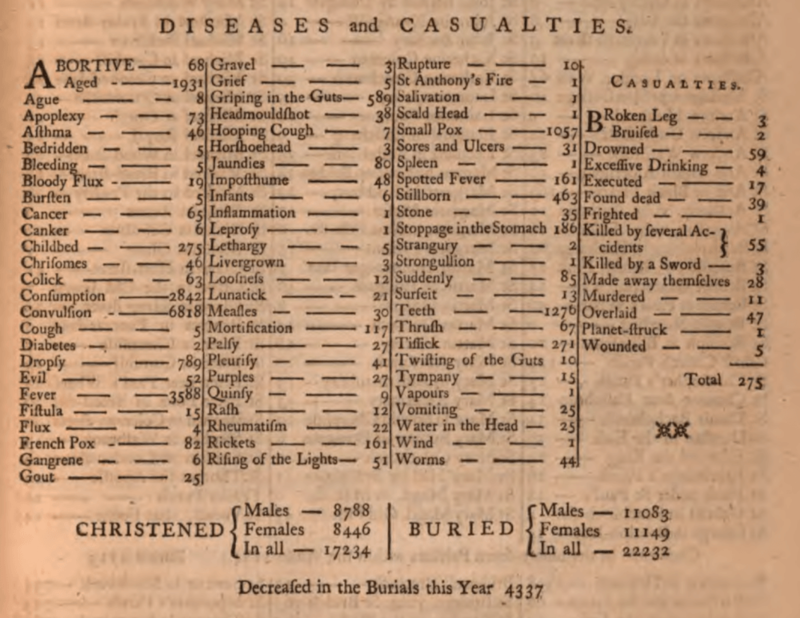 An example from 1715 of the tabulation of Diseases and Casualties – the process of collection and publication continued after Graunt’s death in 1674. Note that one person was “planet struck”, killed by malign celestial influence; probably attributable to the total solar eclipse that took place that year. 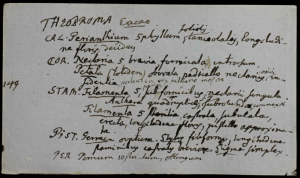 I now turn to Carl Linnaeus, eighteenth century Swedish naturalist, because of his use of paper based technologies – in particular paper slips resembling index cards – to organise his botanical and zoological specimens (Charmantier, 2014). Linnaeus built up a large network of correspondents and former students – “apostles” – around the world, who sent him botanical samples. He was an “entrepreneurial genius in organising complex information networks in a peripheral European power” (Sörlin, 2006). His networking and information gathering were dependent on, and part of, the increasingly globalised systems of the eighteenth century: postal communication, the ships and the offices of overseas trading companies, and government sponsored exploration (Charmantier, 2014). 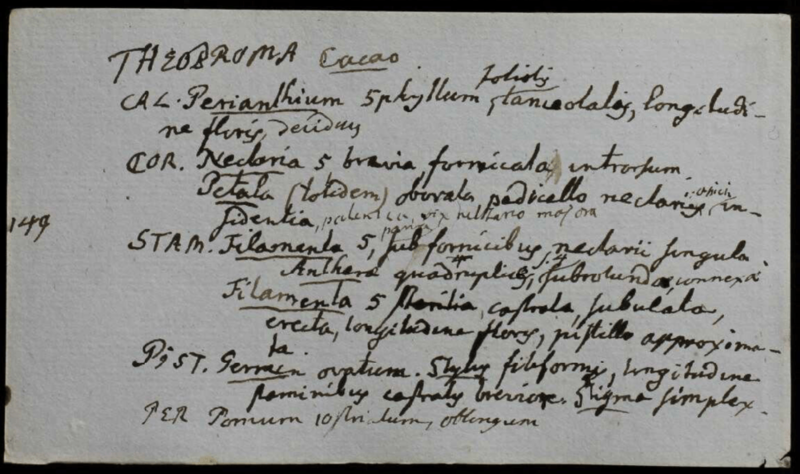 An example of one of Linnaeus’ Paper Slips (1767 – 1773), for Theobroma cacao the cocoa tree, the seeds of which are processed to make chocolate &c..
Actually, one of Linnaeus’ students, Daniel Solander, preceded Linnaeus in realising the practicality of using slips of paper to organise information. Solander moved to England and in 1763 was employed to catalogue the British Museum collection, where he used paper slips. After Solander died subsequent curators continued to use the cards; they were no longer the work of one individual, but represented the work of the institution (Charmantier, 2014). Right, we are a long way from the computer, but one of the major computer companies, IBM, originates in the late nineteenth century, tabulating census data using punch cards, that is index cards with holes in, and the initial idea came from a librarian. 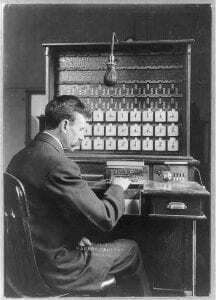 Young engineer, Herman Hollerith, went to work for the U.S. Census office in 1879, where as a “distraction” from his other work he computed life tables for Dr. John S. Billings. While doing this “his attention was drawn to the need for mechanical aids in census tabulation” (Hollerith, 1971). For the 1880 census 1,495 clerks produced 21,000 pages of reports from the census data using the tally system – whereby each census form was examined individually and check marks put in the appropriate box on a tally sheet again, again, and … &c. (Campbell-Kelly, 1996). Hollerith’s daughters recall that their father got the idea for how to mechanise the tabulation process from Billings (a librarian of renown) who “suggested using cards with the description of the individual shown by notches in the edge of the card” (Hollerith, 1971). His idea was to “record the census return for each individual as a pattern of holes […] on a set of punched cards […] It would then be possible to use a machine to count the holes and produce the tabulations” (Campbell-Kelly, 1996). 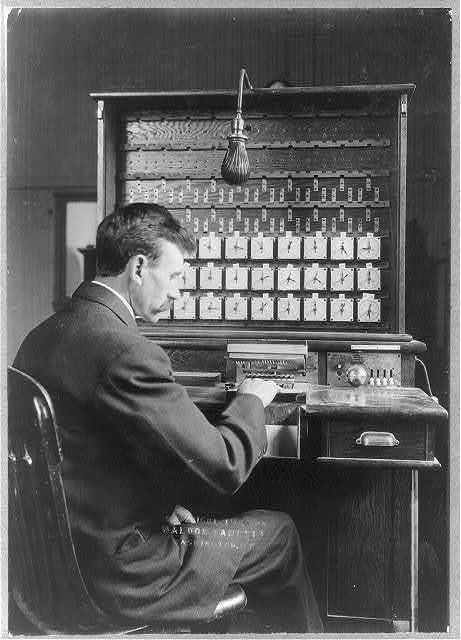 U.S. Census Bureau machine and operator, circa 1908, photo by Waldon Fawcett. “The 1890 census was processed in two and a half years compared to seven for the previous census” (Campbell-Kelly, 1996). So although initially developed to deal with a specific problem punch card tabulators then went on to be “used for processing large amounts of data in many business firms during the first half of the twentieth century” (Yates, 1993). Birch, T., 1759. A Collection of the yearly bills of mortality, from 1657 to 1758 inclusive. Together with several other bills of an earlier date. Campbell-Kelly, M., Aspray, W., ACLS Humanities E-Book, 1996. Computer: a history of the information machine, 1st ed. Basic Books, New York. 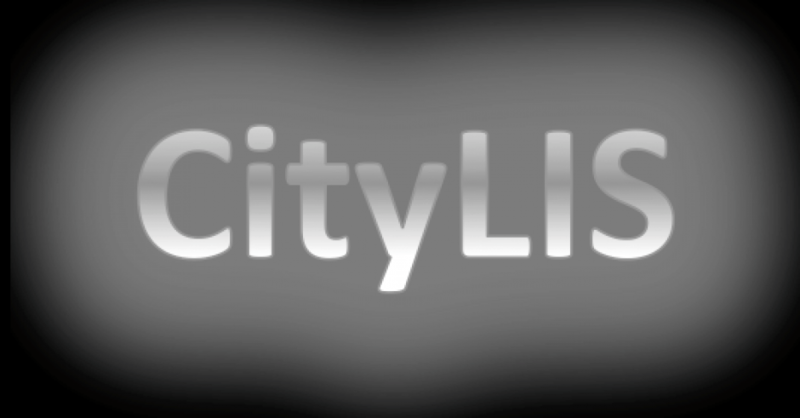 This entry was posted in Student Perspectives and tagged CityLIS, ada lovelace, Alan Turing, History of computing, Library and Information Science, Networks, Student Perspectives. Bookmark the permalink.